Vendor managed ​inventory may be located at: a vendor owned premises, within the customer’s main warehouse, or inside a 3PL storage location. In all of these cases, the vendor is responsible for monitoring the inventory position and to maintain a certain level of inventory as per the service agreement with the customer. This requires complete visibility of the inventor. For inventory maintained within customer premises and at a 3PL location, the inventory data should always be available to the vendor. TPSynergy provides this visibility by providing a common inventory platform that is accessible to all the parties. Inventory data is synchronized to TPSynergy platform using electronic integration. 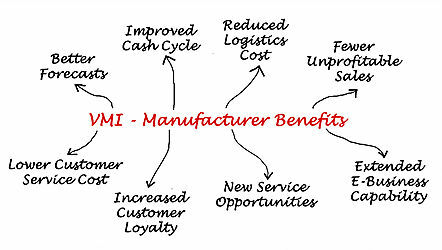 Contract manufacturers are common in most of the industries. They are also called co-packers in food processing sector. While the product is owned by the customer, manufacturing and packaging is done by the co-packers. It is necessary to ensure that the contract manufacturer has adequate inventory to fufill the production requests. Most of the time, purchase orders for raw material are issued by the customers directly to suppliers and delivered to contract manufacturer location. Customer’s MRP system needs the current inventory positions inside contract manufacturer location so that purchase orders can be issued in time. TPSynergy has comprehensive contract manufacturing solutions. As part of this solution, inventory located in the contract manufacturer facility is synchronized with TPSynergy cloud platform so that the inventory position is available to customers. Also small contract manufacturers and co-packers can maintain the inventory data in Excel spreadsheet format and upload into TPSynergy. Consigned inventory is the reverse of vendor managed inventory. This is the inventory with customers and distribution channel. TPSynergy provides visibility into this inventory by collecting current inventory picture either through electronic integration or periodic excel uploads. Large customers prefer to provide inventory update through EDI Integration while small and medium business prefer to do an excel based inventory updates. Retail inventory is the inventory in stores and shelves. Depending upon the contract, this inventory may belong to the supplier or to the customer. TPSynergy uses EDI Inventory feed to get the current retail inventory located in various stores. This information is used by many demand planning systems to manage replenishment forecasts. Third party logistics providers (3PL) will manage the inventory on behalf of the customer. Supplier shipments are directly delivered to 3Pl warehouses and customer orders are directly fulfilled from the 3PL warehouses. As 3PL belongs to different company, it will not be possible for the customer to access the ERP of 3PL provider to view the current inventory. TPSynergy fills the gap here by collecting inventory status update from the 3PL and makeing it available to the customer in real time. The same inventory data can also be synchronized to customers back end ERP system so that all the systems work in synchronization. This is achieved through delivering Supply Chain Integration as a Service. This is a very important visibility requirement in supply chain. Shipments that are in-transit are critical supply source in a supply chain and need to be monitored closely. As suppliers have already shipped, the order, it might not be in their radar and as it is not yet received into the warehouses, it is neither in the radar of customer. So the in-transit inventory is in no mans land. Many a times, the inventory will get stuck en-route. For example, stuck in the customs clearance for want of some documents. TPSynergy monitors the in-transit inventory and sends alert if it is not received within the stipulated time. Also TPSynergy uses Internet of Things (IOT) devices to closely monitor the shipments and take corrective actions if the shipments are delayed. The challenging aspect is providing visibility into the aforementioned situation. 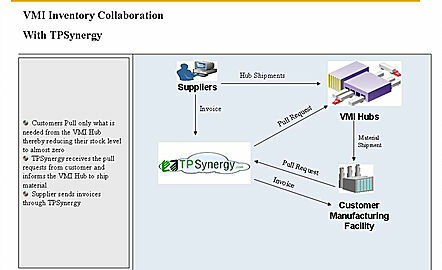 TPSynergy provides this inventory visibility with its collaboration platform for everyone to sync up their inventory. Using TPSynergy, everything from advanced Electronic Integrations to simple file uploads or even manually updating the inventory provides the much needed inventory visibility. In addition, proactive monitoring can alert when inventory is below or above the optimum level. A comprehensive dashboard provides a global view of the inventory, drawing attention where there might be problems. How does it benefit your supply chain? It all matters for On Time Delivery.